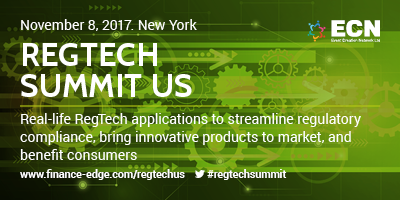 RegTech Summit USA in New York! kompany was proud to be a sponsor of the RegTech USA in New York last month. Russell Perry, our CEO and Founder, was a panel interviewer on the topic of: RegTech for business benefit – improving products and services for consumers. Other guest speakers included: Bradley Giemza, Chief Technology Officer, from MUFG Union Bank and Simerjeet Chhatwal, Deutsche Bank’s Global Head of Compliance Technology. The panel discussed various matters such as which regulations are causing an increase in costs and how RegTech companies can help firms bring innovative products and services to the market. Perry was a guest speaker explaining how Business KYC Digital Onboarding is moving from Audit Proof to Audit Trail. kompany and Kompli-Global are proud to be working together and supporting both client offerings. During the event, Kompli-Global showcased the new kompli-IQ solution and how it is transforming the financial crime and regulatory compliance space by combining cutting-edge Artificial Intelligence (AI) technology, human expertise, and effective processes. © 360kompany AG –Gußhausstraße 15/5, 1040 Vienna, Austria – Commercial Court Vienna FN 375714x. All rights reserved.